Potatoes Lyonaise, an easy, classic French gourmet side dish. These are incredibly easy and delicious, and pair well with flavorful fish and chicken. They absorb the chicken stock at the end, giving them a bit of a syrupy glaze. Peel onion, cut in half and slice thinly. Sauté onion and garlic in medium nonstick frying pan in 2 tsp butter until lightly golden, about 10 minutes. Cut potatoes in quarters lengthwise, then slice thinly. 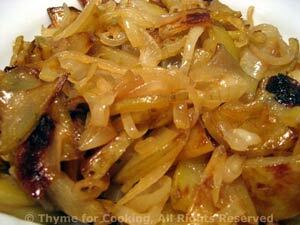 Remove onions and garlic from pan. Add 2 tsp oil, potatoes and sauté until golden, turning often with spatula, about 20 minutes. When potatoes are golden, return onion and garlic to pan, add chicken stock, cover and simmer until stock is absorbed, 5 - 10 minutes. Measurements are actual measurements used for calculation. If there are no values the nutritional numbers were simply too small.